Today’s recipe is summer on the farm to me. 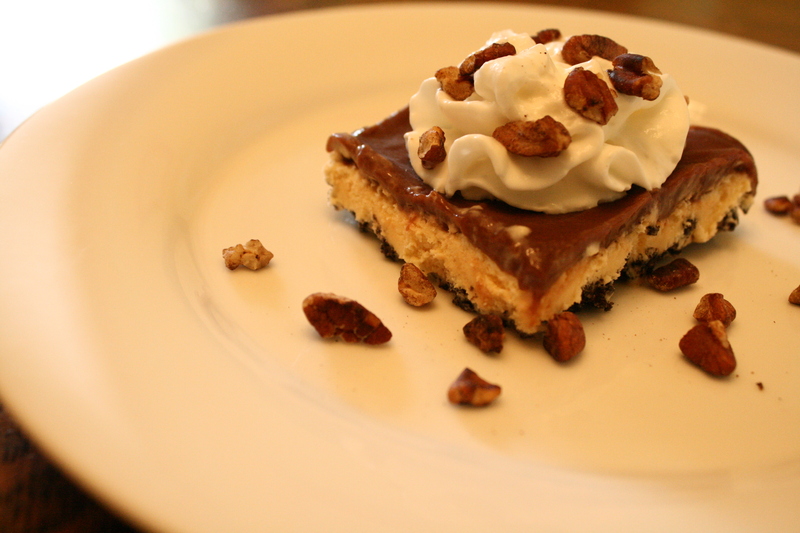 It’s funny how food can bring back so many specific memories, and this dessert can really do it. Me and my sister would spend time during summer vacation at grandma and grandpa’s farm, and when it came time for lunch, that was when we had the big meal. Grandpa, being a farmer, needed that energy for the hard work he would do all afternoon and sometimes into the evening. It was always fun to have dessert at lunchtime instead of dinnertime. It was so strange to me, but I loved it. We called this Danish Pudding, but the official name on the box is Junket Danish Dessert. I never asked Grandma about this, but I wonder if the reason they first tried this dessert is because my grandpa was half Danish. Hmm. Could be. Heritage was always very important to those two! Whatever the reason, I’m glad they made it a part of the tradition of visiting at Grandma and Grandpa’s house. I do remember that when I finally got to help Grandma make this, I was amazed at how simple it was. It’s just a box of the dessert and water. It’s so easy to make and so unbelievably good! We usually had the strawberry kind, which is my personal favorite, but for this post I used the raspberry flavor. 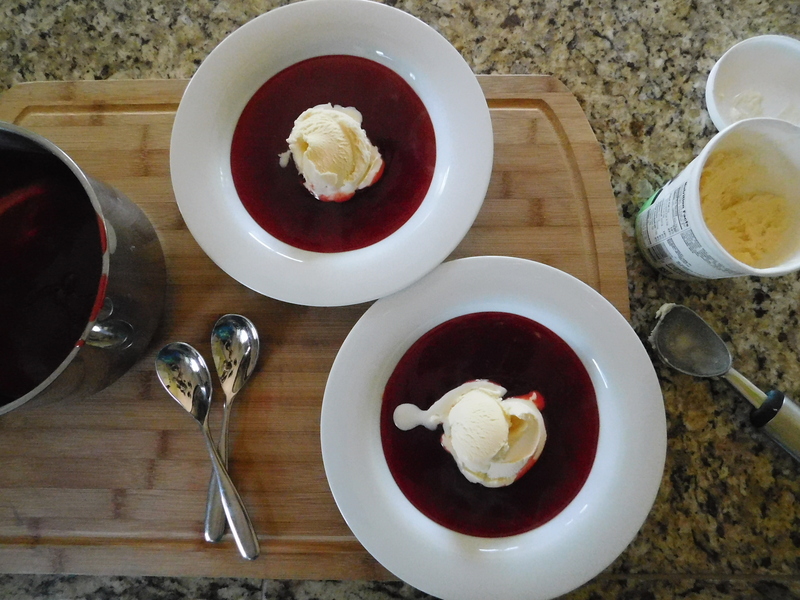 This dessert was also used, occasionally, for making the glaze for strawberry pie, so maybe we were just using up an extra box that wasn’t used for pie. In any case, the addition of the vanilla ice cream was genius. There’s just nothing better – it’s so fruity and so creamy. You buy a box and follow the directions for pudding. When you first mix the water and pudding mix, it looks a bit cloudy. 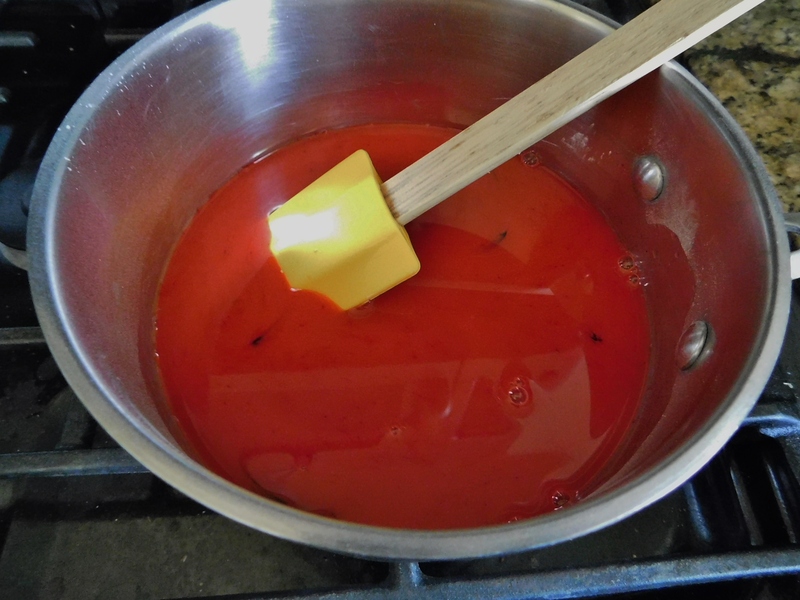 When it starts to boil, the color turns a dark red. We usually had this warm for dessert after lunch. It’s mandatory that you serve this with vanilla ice cream. 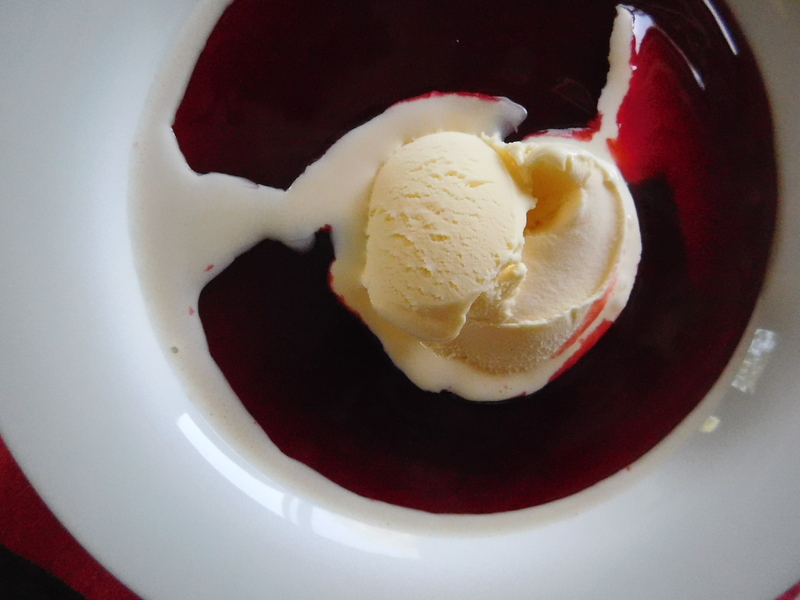 The pudding is warm and the ice cream is cold and when the ice cream starts to melt, you MUST stir and make white swirls in the red pudding! That’s just how it works. 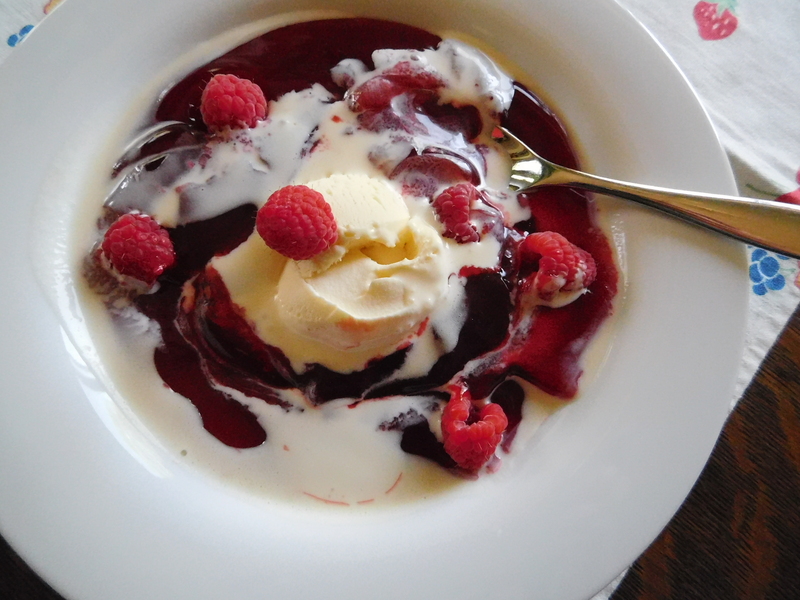 I happened to have some fresh raspberries when I made this, so I gilded the lily just a little bit. When you stir it up and get the melted ice cream in a bite with the warm fruity pudding . . . heaven. Summertime on the farm and those great memories of having lunch together and Grandpa coming in from the fields or working somewhere in the yard or the shed. Try this unusual pudding for your next lunch. 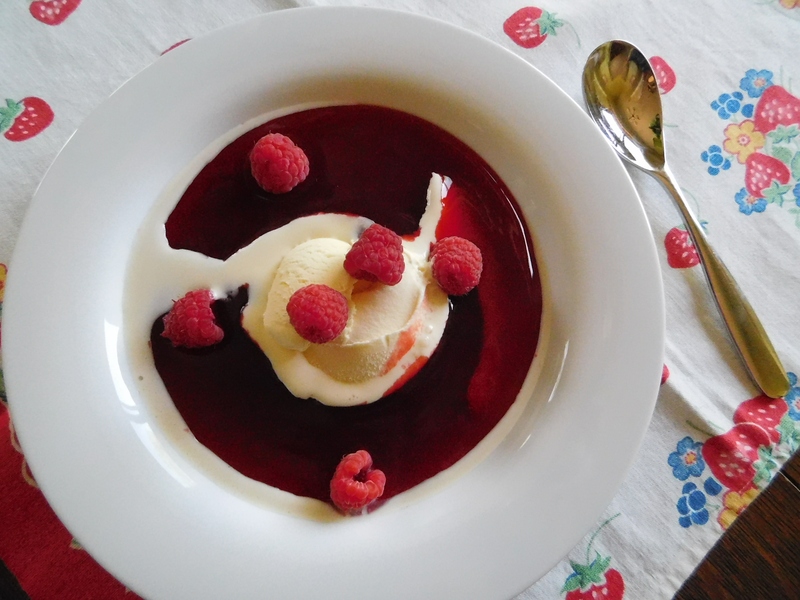 You’ll love this fruity, creamy, delicious dessert! Pumpkin, pumpkin, pumpkin. Pumpkin is synonymous with this time of year. There are just so many great things to do with it. I’ve posted a few recipes over the years. 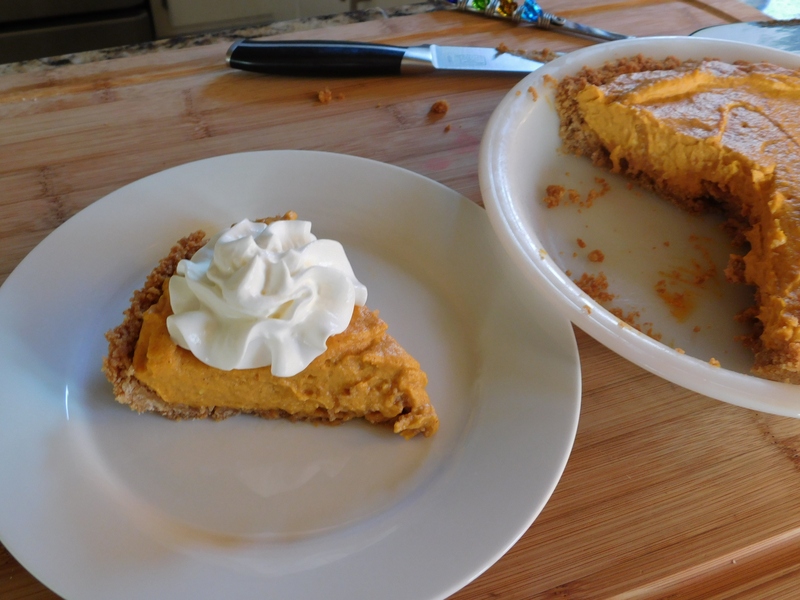 I’ve done Pumpkin Pie – the Chiffon Kind, Pumpkin Pie Dessert, Pumpkin Cake, Pumpkin Cream Cheese Pie , and Autumn Gold Pumpkin Cake. I’ve done Sweet and Spicy Pumpkin Seeds, Freezing Pumpkin, and Knit Pumpkins. I haven’t even done just your basic Pumpkin Pie yet. 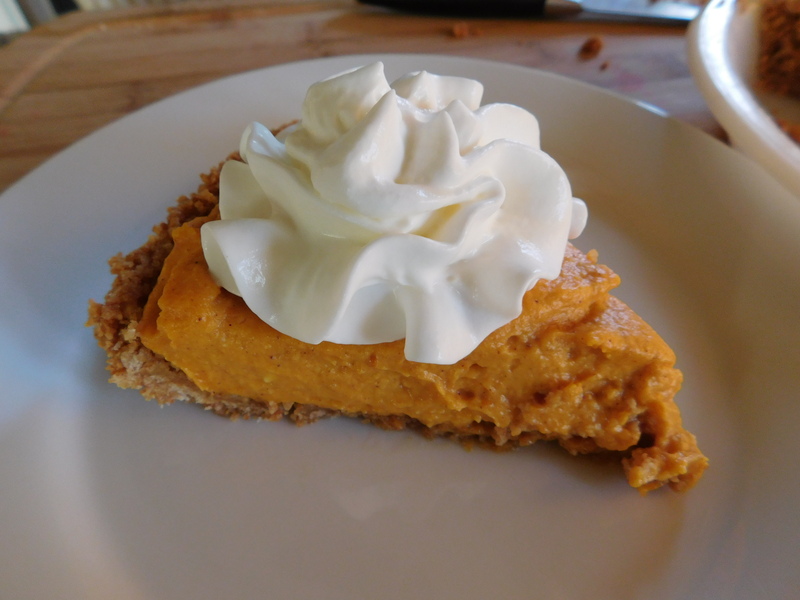 Here is another great fast and easy recipe for one more kind of pumpkin pie. 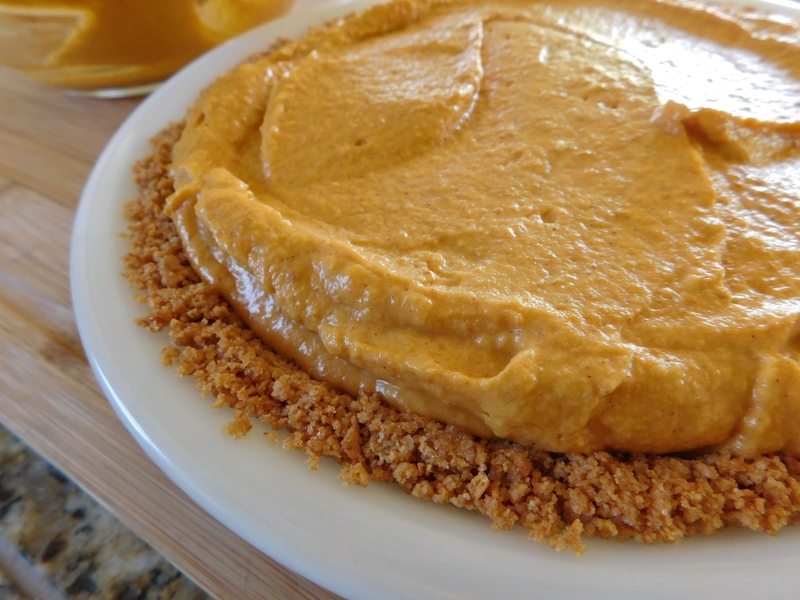 This No-Bake Pumpkin Cream Pie is a great pie to do last-minute. I love how easy this one is! 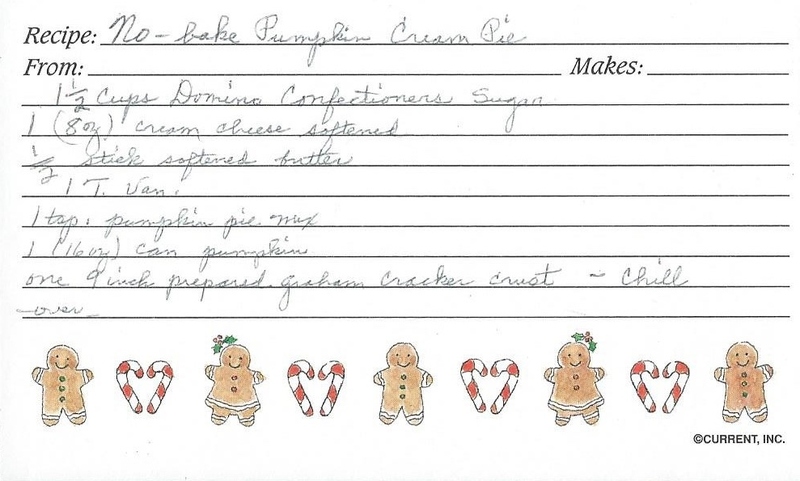 Here is the recipe for a graham cracker crust that I used. The filling is so smooth and luscious. 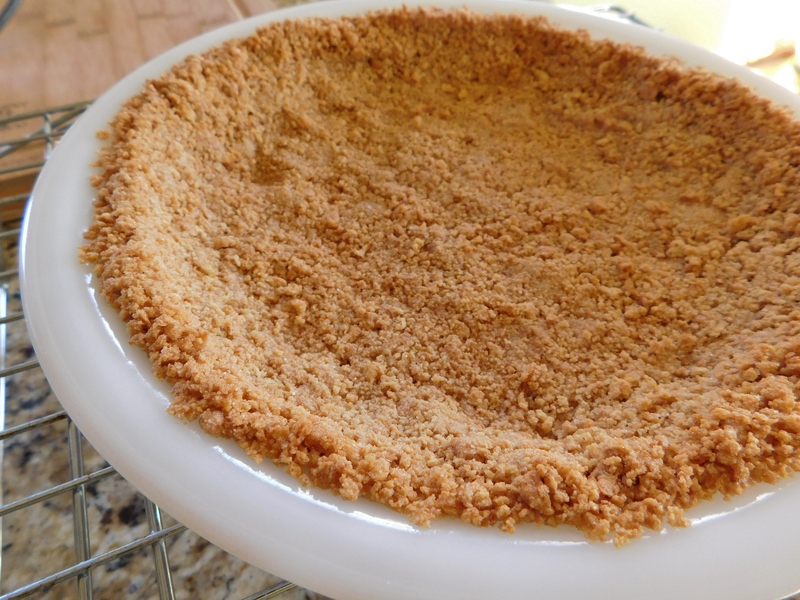 I wanted to use my pretty milk glass pie plate, so, as usual, I had some graham crumbs and filling leftover. 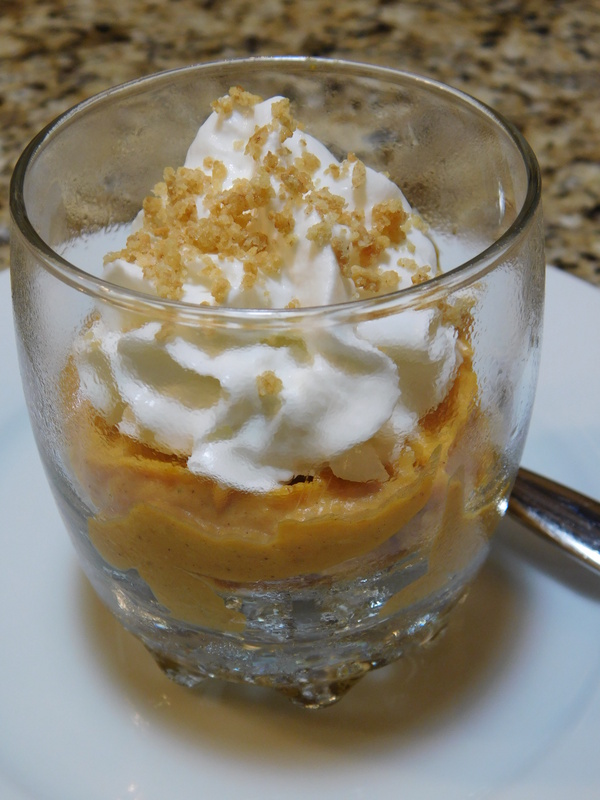 I put crumbs in the bottom of the glasses and made 3 desserts for dinner that night. 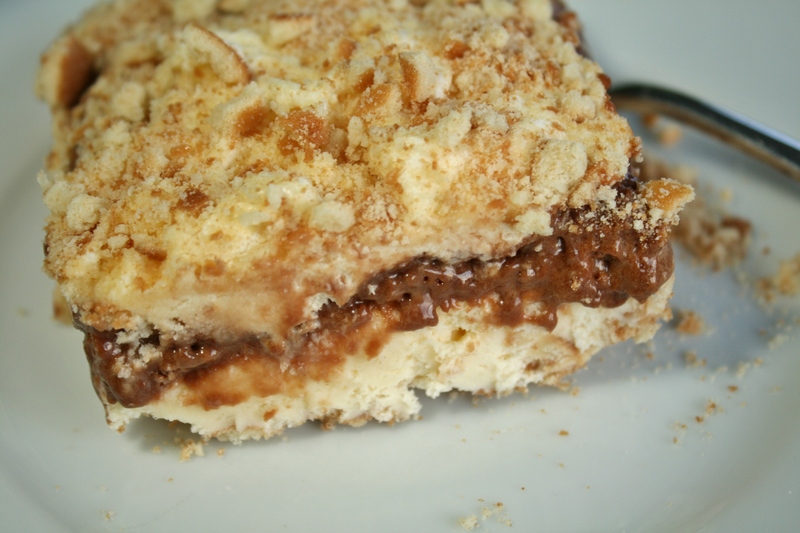 Topped with some whipped cream and more crumbs – delicious dessert! It’s a soft pie and the cream cheese gives it a bit of a tangy taste. 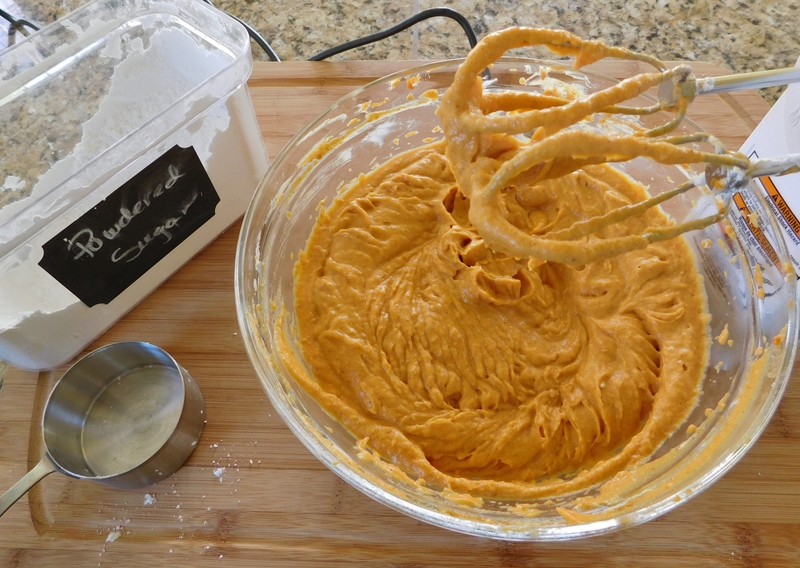 Any of the pumpkin recipes mentioned at the top of this post would be great additions to your Thanksgiving table, but this is also a great recipe. I love that you can make it VERY easily the night before (you could even stretch it to two days before your gathering). Done. Ready to go. You’re going to love this one and so will your guests! 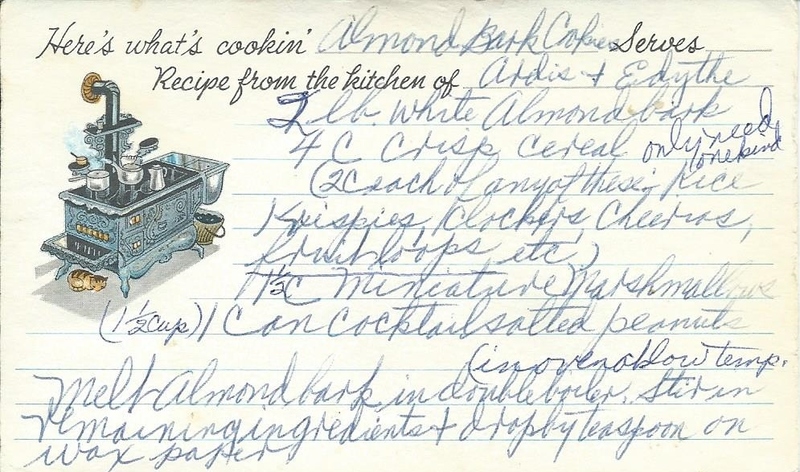 Today’s recipe comes from one of Grandma’s sisters, but it has Grandma’s name on it. 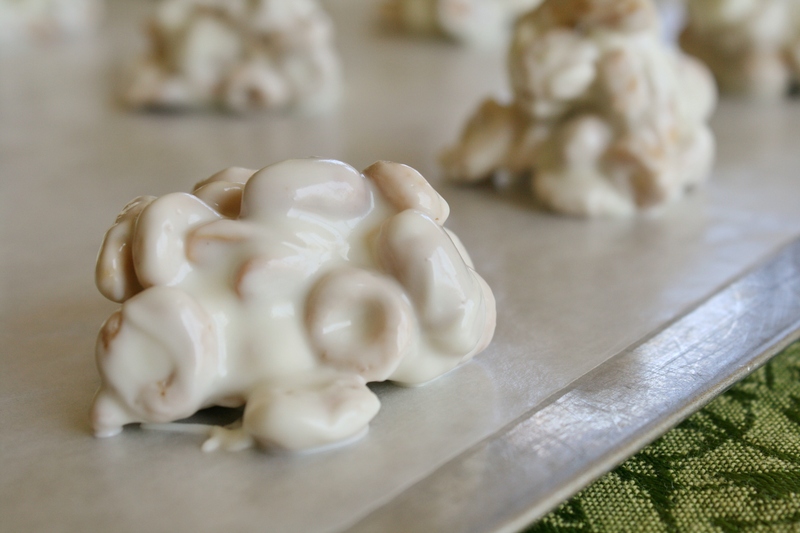 The possibilities are endless for these Almond Bark Cookies. You could add any kind of cereal you want, and I think the idea of adding bright and cheery colored Fruit Loops cereal would be so great for kids. I used Cheerios with this batch, just because that’s all I had on hand. 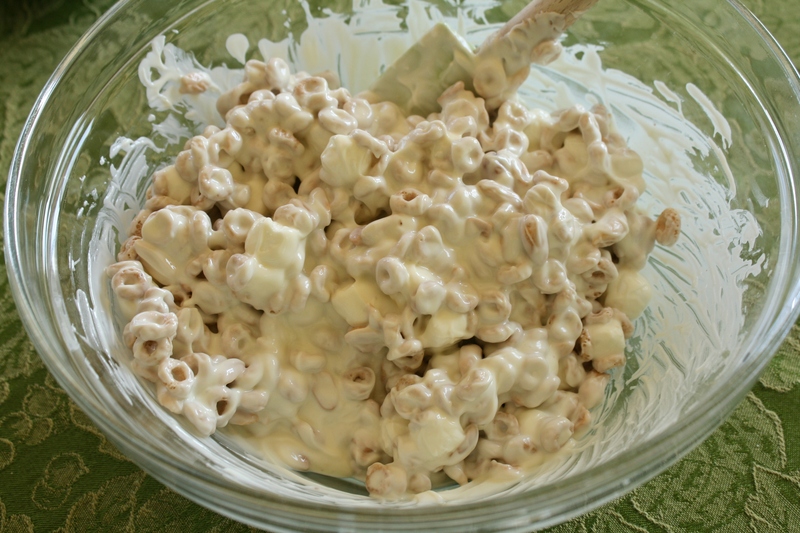 I do seem to remember Grandma making these when I was growing up, and I think she used Rice Krispies. I also seem to remember that she made these around Christmas time because they are kind of a candy, too, not just a cookie. Cereal always reminds me of staying weekends at Grandma and Grandpa’s farm. I don’t know why, but it was so exciting to go there and have cereal for breakfast. She would have several kinds of cereal to choose from, and that was so much fun! We didn’t have that selection at our house, because I don’t think some of us ate breakfast every day (Mom! Ha! She still doesn’t!). 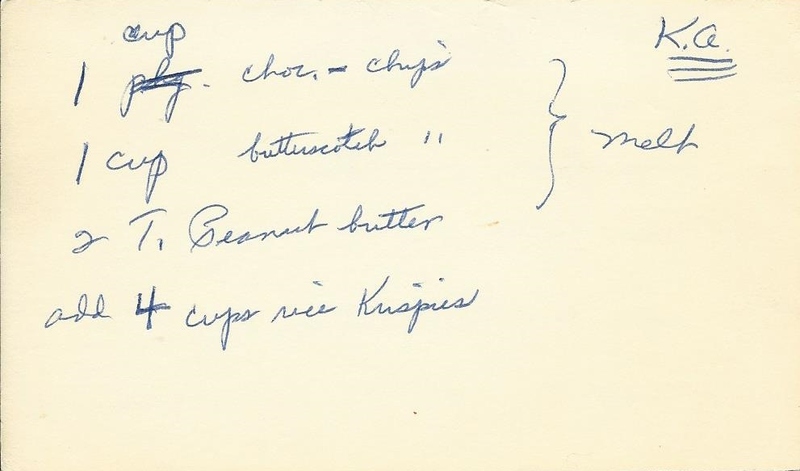 Grandma had a lot of cereal because they ate breakfast every day after the initial morning chores. I would assume that when you’re up at sunrise getting the livestock fed and other farm things ready to go for the day, you have a cup of coffee (or Postum) and/or maybe cereal before you head out, and when it’s everybody else’s normal time to get up in the morning, you’d be just coming in for a more/bigger breakfast. So she probably had plenty of cereal on hand to make this recipe. 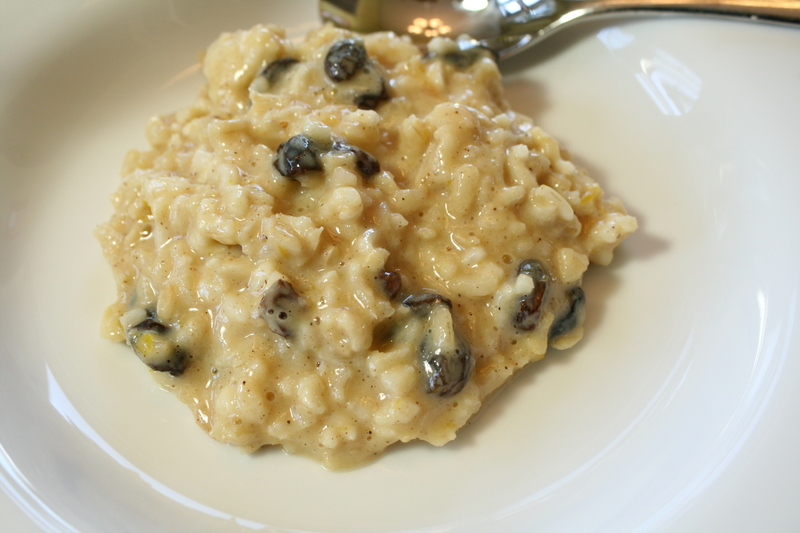 This is a great recipe any time of year. 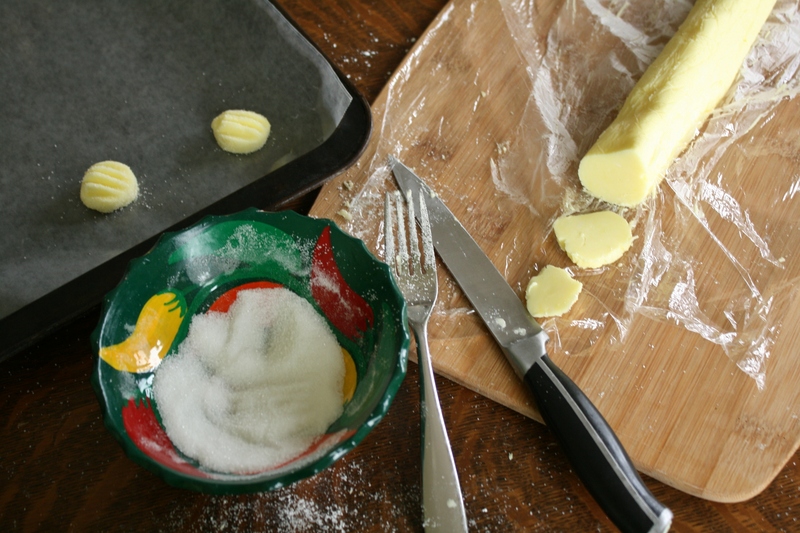 We’re heading towards summer and not wanting to heat up our kitchens, so now is a good time to share this recipe. 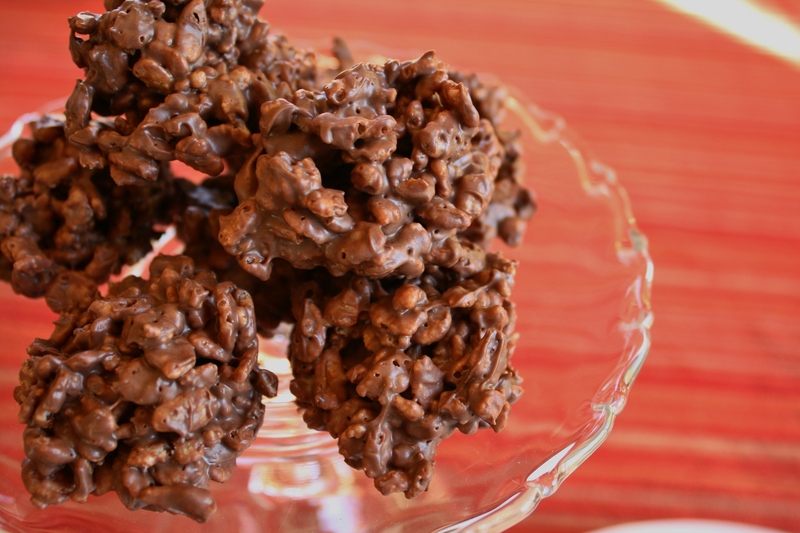 This one is no-bake goodness! 2 cups crisp cereal (you can use a combination of more than 1 if desired) of your choice: Rice Krispies, Cheerios, Fruit Loops, etc. I got about 3 dozen cookies from this half batch, but as usual, I probably made them bigger than Grandma would. I might have to try some other kinds of cereal for these bars. The summer stretches out ahead of me, just waiting for treats! 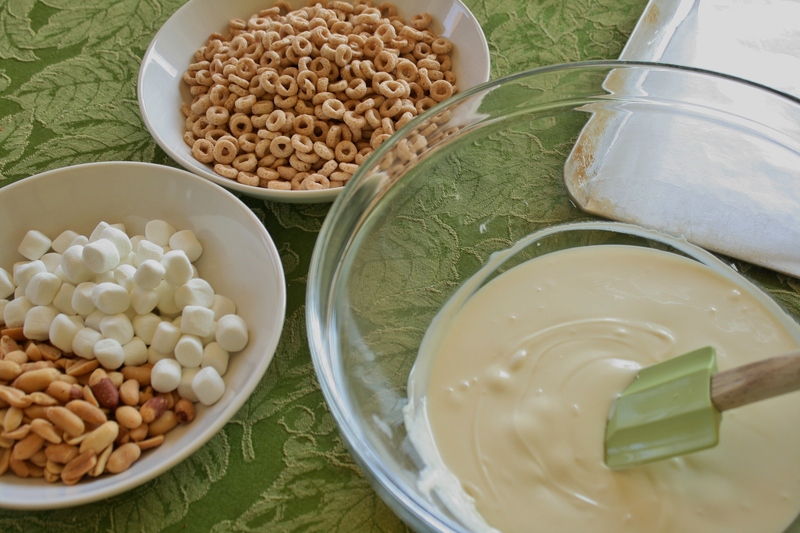 I added an extra 1/2 cup of Cheerios because there seemed to be a lot of melted almond bark. I tried to make these small, I really did. I didn’t make them TOO big. I wanted to. They seem a bit addictive to me. But that might just be me. This is a great, easy recipe. You could top them with sprinkles, too, if you want to make them more fancy. 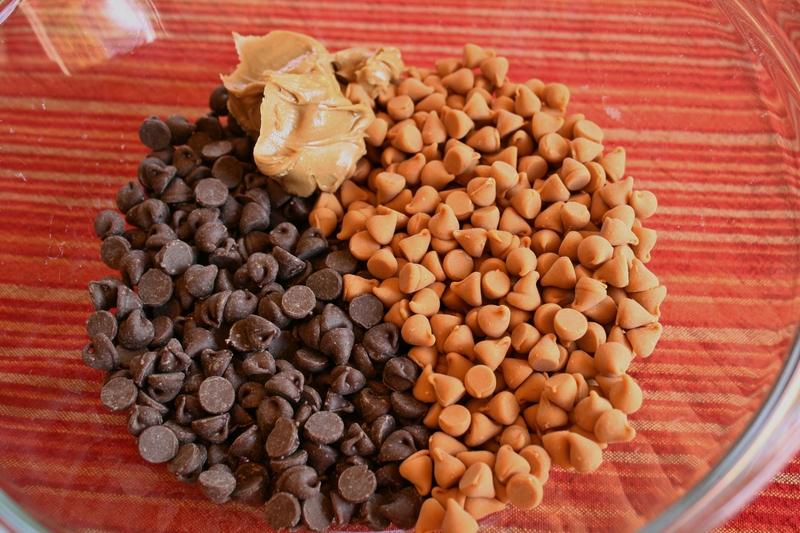 These treats will be good for summer gatherings, camping trips, or weekends! I remember having these Butter Mints at big family gatherings back when I was a kid, but I don’t know where they came from or who made them. All I know is that they were delicious and I LOVED them! I have never made them and when I had the excuse of making them for a birthday party, I decided to give it a shot. 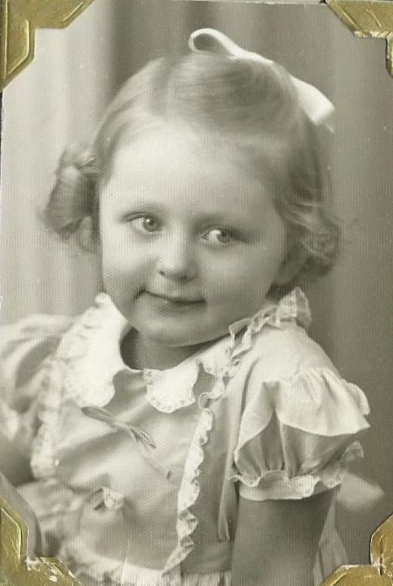 The birthday party is for my mom and here’s the birthday girl at about age 4 – what a sweetie! She’s celebrating a big birthday this year. I’m sure she wouldn’t mind me telling you that she just turned 75. 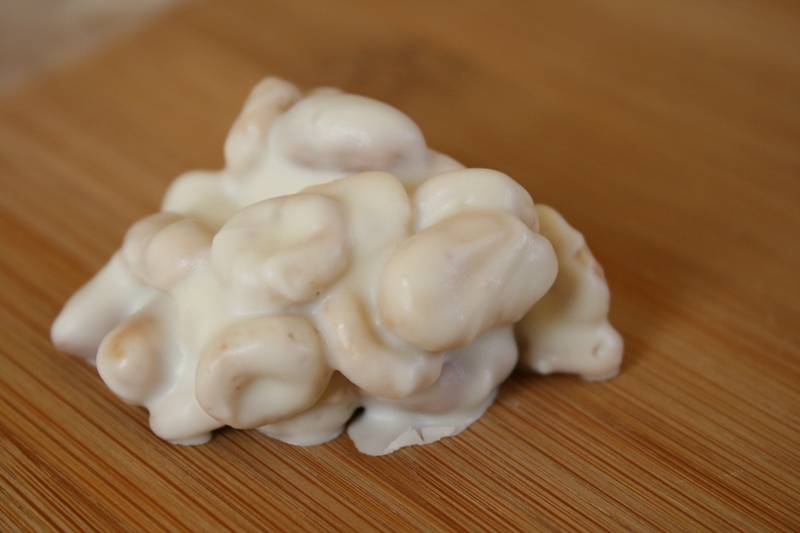 I wanted to make these mints for the birthday party, so I looked up a recipe and found one from Emeril Lagasse – you can find the original recipe here. These only have 3 ingredients and are VERY easy to make. 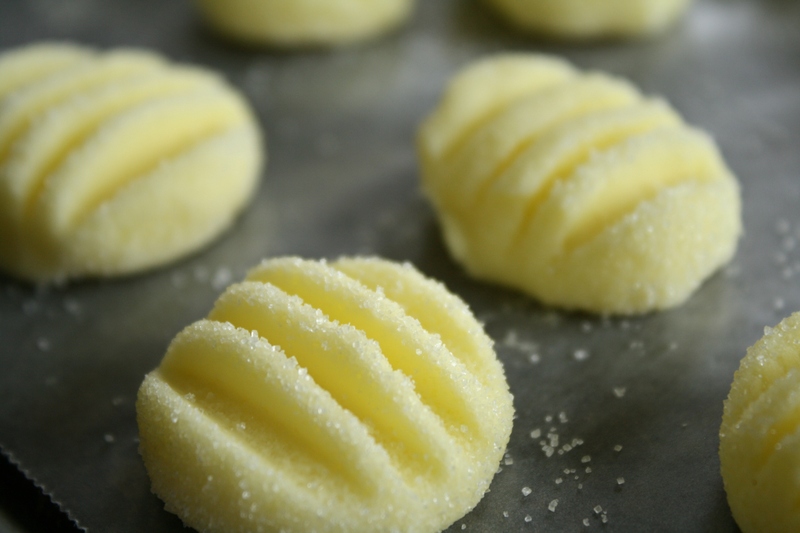 There is also the possibility that the mints that I had as a kid were made with cream cheese, but these made with butter are the ones I’m trying today. 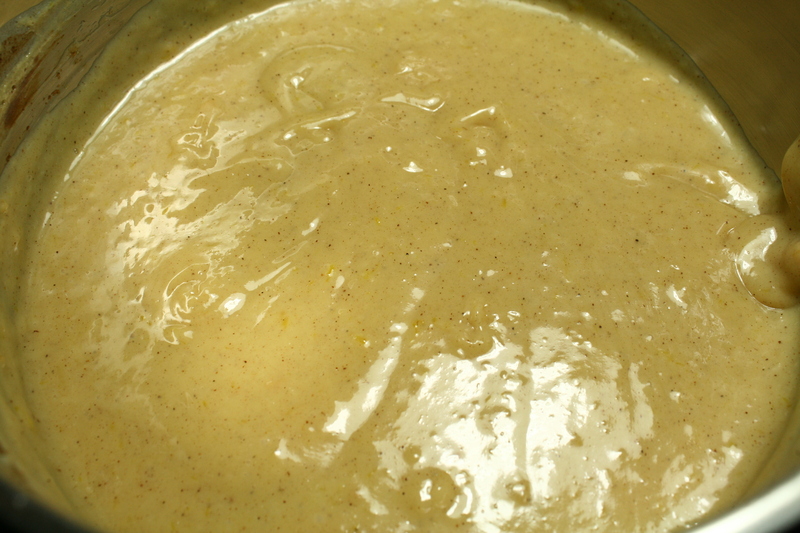 Cream butter in large bowl with electric mixer until softened. 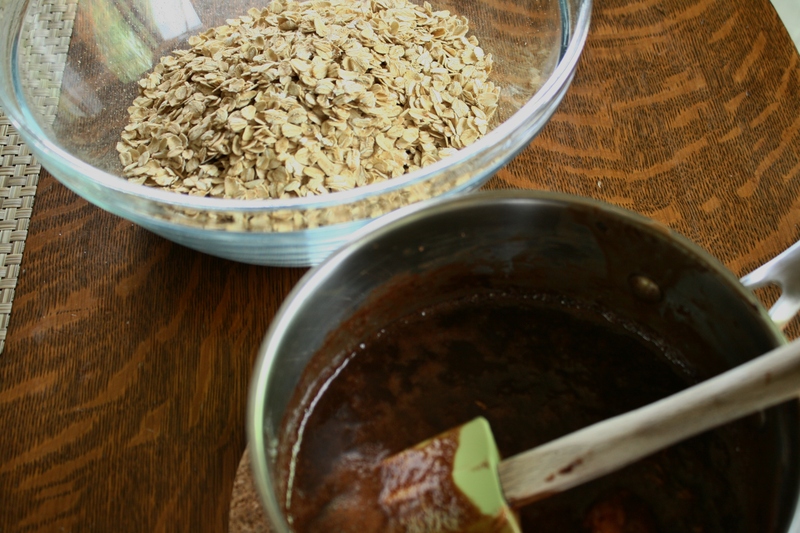 Add sugar and extract, mixing at low speed, until mixture is thick, creamy, and smooth, scraping down sides of bowl. Divide mixture in 2 parts, putting each part onto a sheet of plastic wrap. 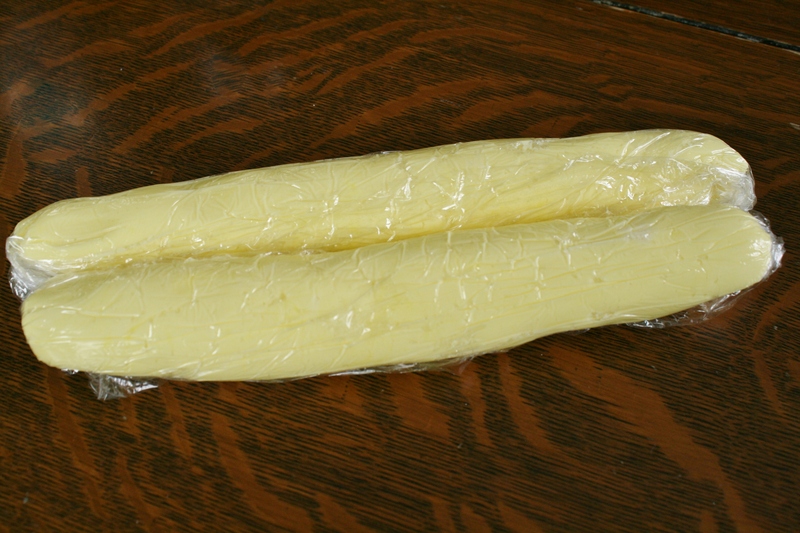 Roll up into a log about 1/2 inches in diameter and put into refrigerator to chill for 4 hours. 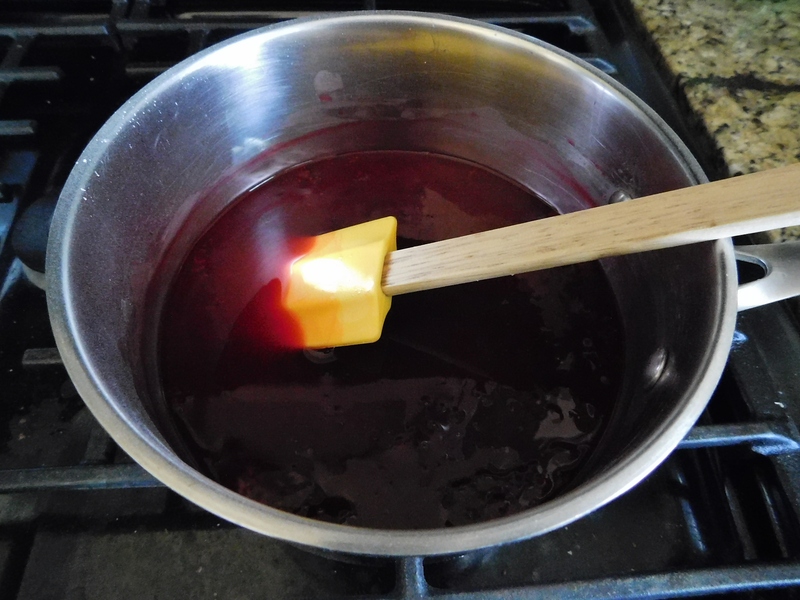 Scoop with a teaspoon measure, roll into balls, place on waxed paper, and press with tines of a fork. Refrigerate until ready to serve (some people say to cover with a paper towel and leave them out for a day or overnight). Having done these mints now, I would have made the logs smaller in diameter. It would make it easier to roll the mints into balls. I did see that sometimes they are rolled into thin “snakes” and just cut with a knife into pieces instead of rolled and pressed with a fork. I started out trying to use a teaspoon measure to get the balls all the same size, but it was nearly impossible when the logs are chilled. I tried slicing the logs into even slices and that worked pretty well. I saw somewhere online, when looking for the recipe, that one person rolled the balls in granulated sugar. I tried that and I like how they look kind of sparkly. It also helps the mints not stick so much to the waxed paper. One more tip – don’t have the tines of the fork cover the entire ball when pressing it down. This allows you to gently use your fingertip to hold the mint in place while lifting the fork off of the mint. These mints absolutely melt in your mouth. They’re great for parties, but they’re REALLY great anytime. 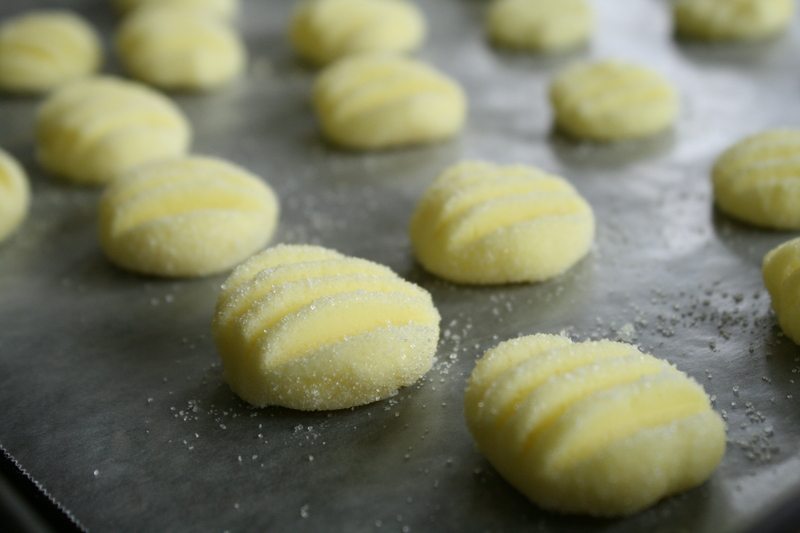 So good, so pretty, and so buttery – just like I remember! 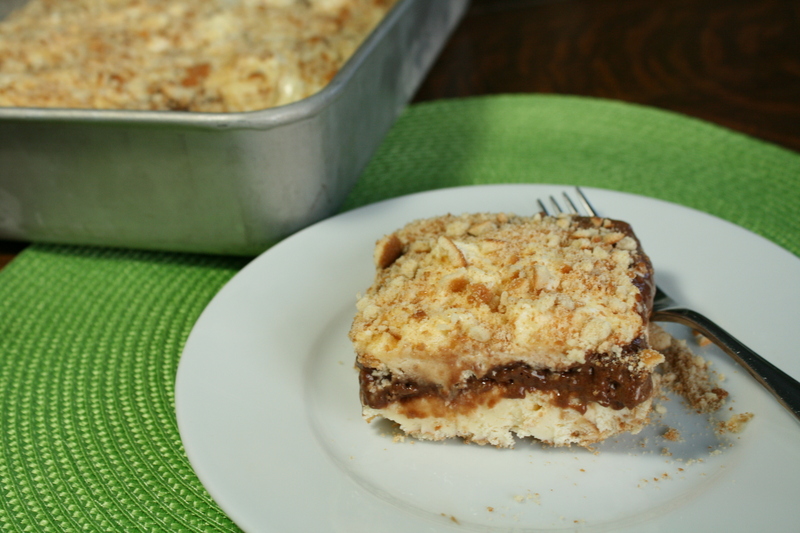 This is one of those desserts that I can soooooo see Grandma making for entertaining. Chocolate Ice Cream Dessert is right up her alley. It’s got ice cream, an easy to make crust, and chocolate. Perfect. 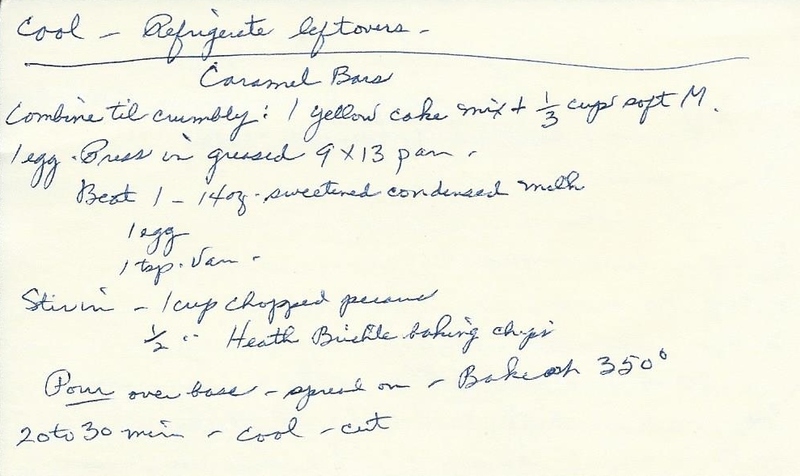 My husband thinks Grandma had quite a sweet tooth because of all of the recipes she had for sweets and desserts, but I think she had this many recipes because of the unbelievable amount of entertaining they did. They entertained a lot with family AND friends AND church groups. One of the last times that she and Grandpa entertained a large group was just before they moved to the assisted living facility where they lived out their days – they had 8 people “in” and I think it was for dinner. They were around 85 and 88 years old at the time. Those two just loved to entertain. This is another very easy, very good dessert. 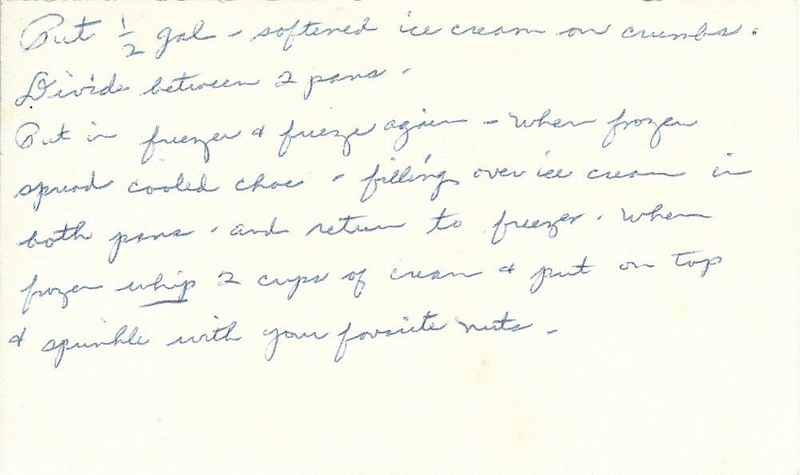 While mixing other ingredients, take out one gallon of vanilla ice cream to soften (of course the amount in a box of ice cream are not what they were back then, but I used one box anyway, even though it wasn’t a full gallon – it was a bit short). Put half of gallon of vanilla ice cream on top of crushed vanilla wafers (it will get softer while you make the rest of layers). I used a spoon to evenly put it on top of the crushed crumbs. 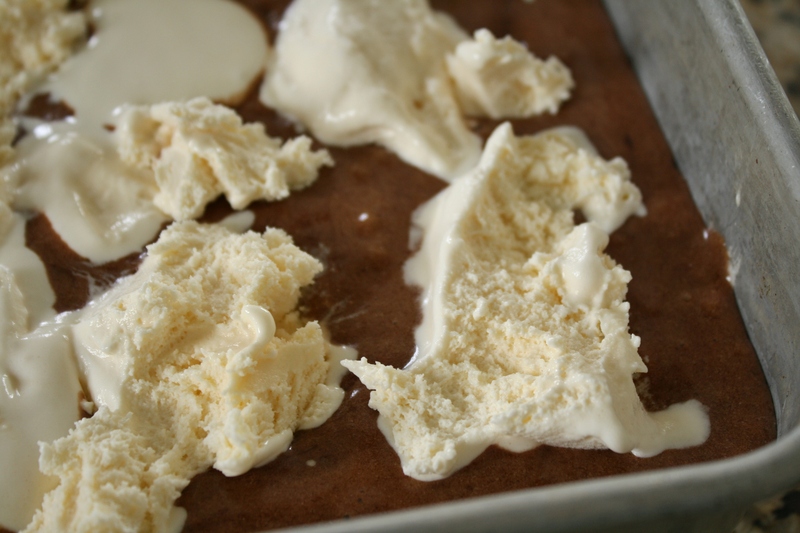 Put this chocolate mixture on top of layer of ice cream (on top of crushed vanilla wafers). 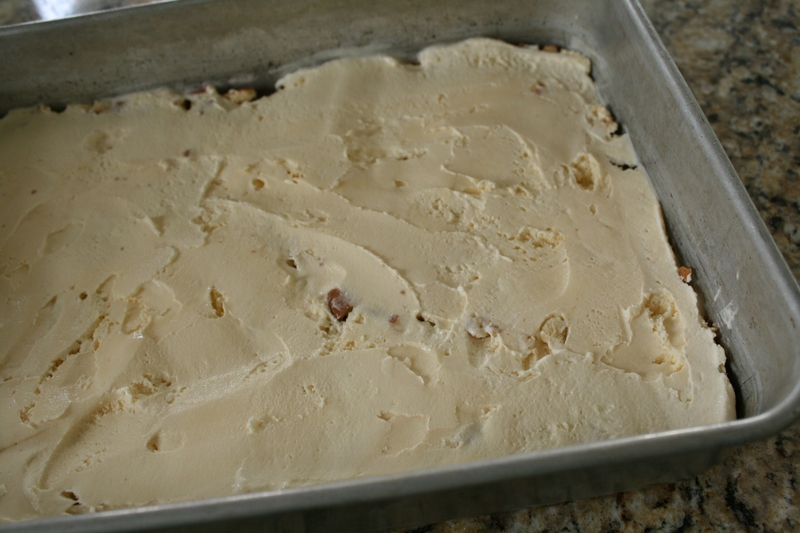 Layer on the other half-gallon of softened ice cream. 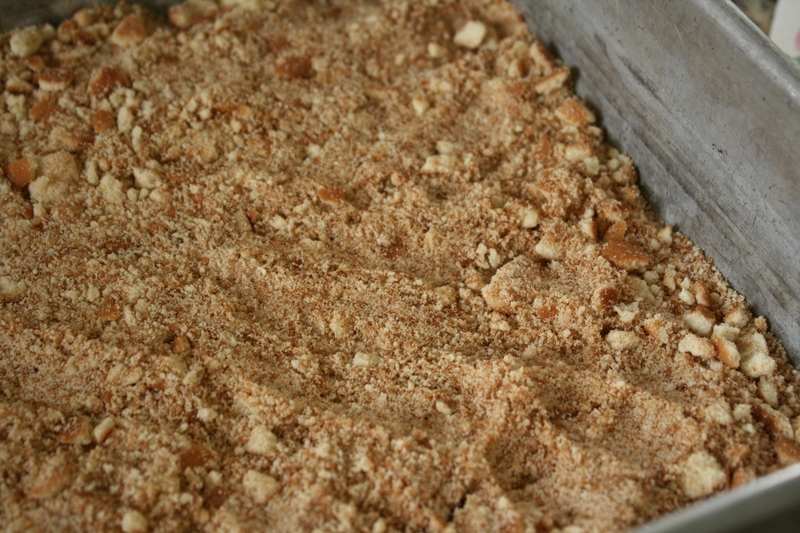 Top with the rest of the vanilla wafer crumbs. The chocolate mixture is quite thick until folding in the egg whites. 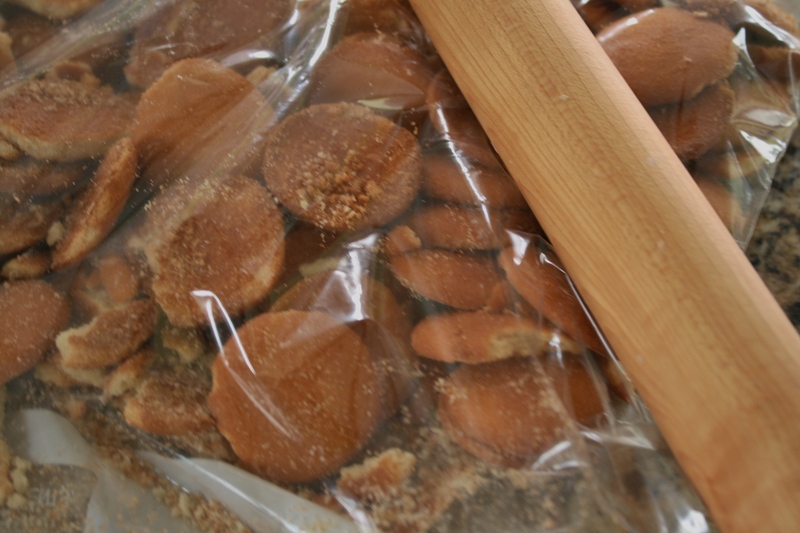 I used my trusty rolling-pin/plastic zip top bag system to crush the vanilla wafers. 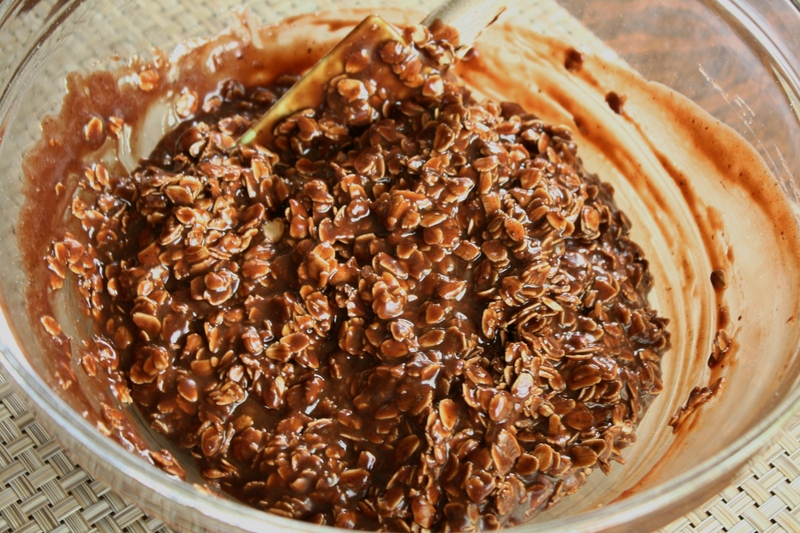 I spread the ice cream with my small offset spatula and then pour on the chocolate mixture. I didn’t get the ice cream split exactly in half, but once the rest of the vanilla wafer crumbs were sprinkled on, you can’t really tell that the top layer of ice cream is a little short. I had this in the freezer overnight and it stayed pretty soft. It didn’t get rock solid but held its shape just fine. This dessert is delicious. Try this one next time you need a different kind of dessert. It’s great for entertaining! 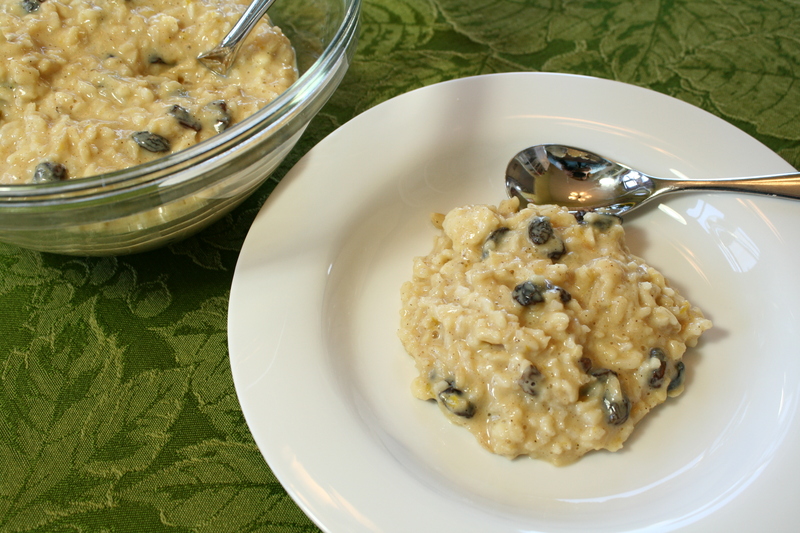 The recipe for today is one that we all remember from childhood. 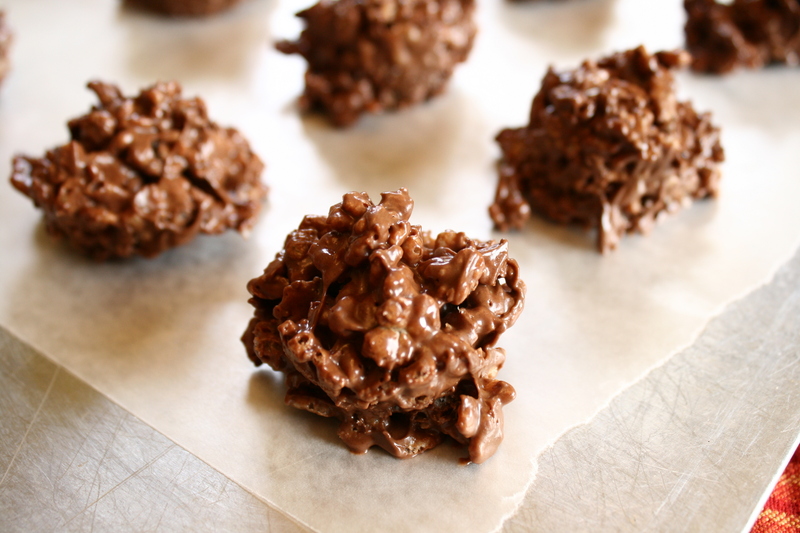 These No-Bake Chocolate Cookies were made by everyone back in the day. 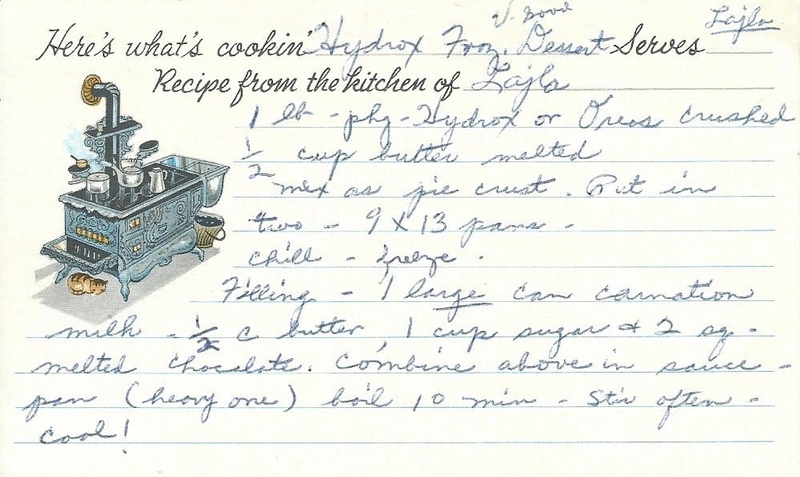 This is another recipe that I thought was lost and then I found it in one of those old church cookbooks that my mom gave me. Hot summer days call for more treats that we can make without heating up the house and this is just one more for our no-bake repertoire. 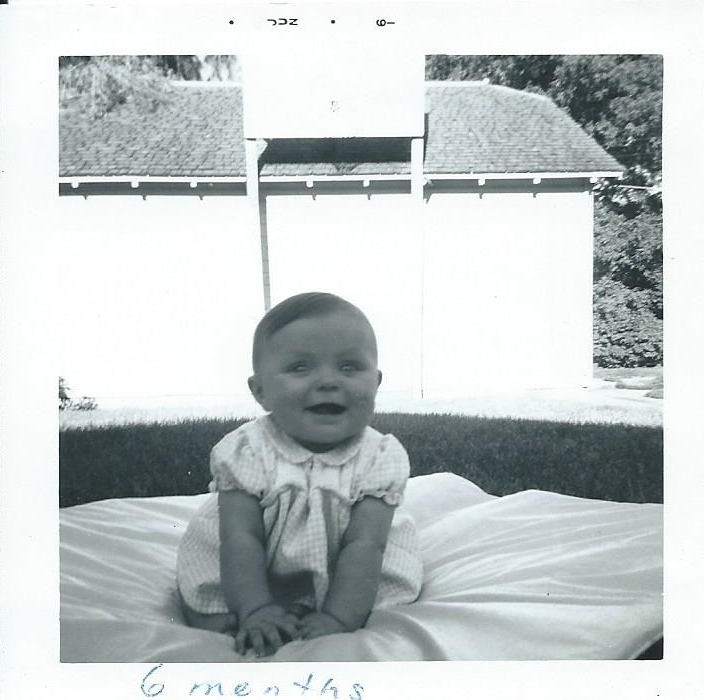 This is a summer photo of me at 6 months old. As you can see by the chubby cheeks, I was destined to be a cook and a baker! I hope I had just had a bath and the hair is not slicked down because I was sweating in the heat. I don’t really care for heat OR humidity even now. There were also comments made by my dad (and others) about the shape of my round head and a bowling ball. But that’s another story for another time! So . . . on to the recipe. 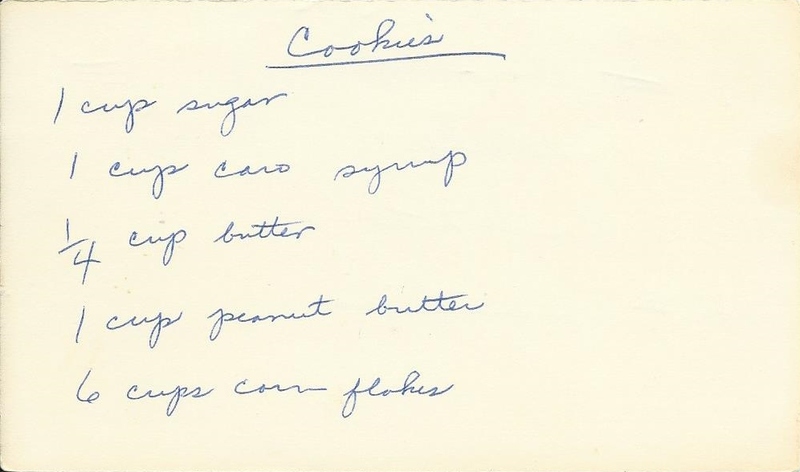 These cookies are a classic and you’ll remember them, I’m sure. I LOVE these cookies and I think that both of my grandmas made these. Bring to a full boil for one minute. Drop onto waxed paper and cool. Mixture hardens quickly work fast. They aren’t kidding about mixing it fast. It does firm up pretty quickly. I got about 3 dozen cookies making them the size I did. These are so tasty and they really do remind me of childhood. Summers were so much fun back then. 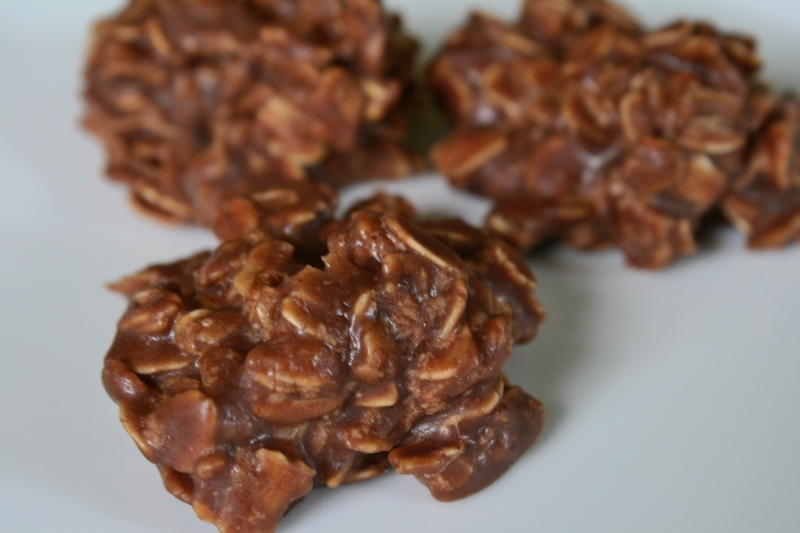 Let’s make summers fun now, too, and make a batch of these classic summer no-bake treats! Today we’re doing Part One of a two part post on these little treats. Part Two will be a quick tutorial on how to make a cute glass pedestal to display the cookies on. 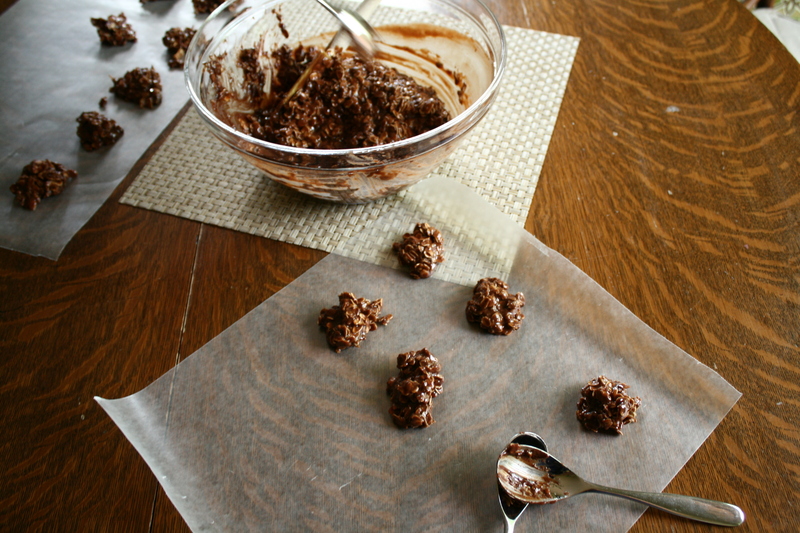 The recipe is a very quick and easy one called Chocolate Rice Krispie Cookies. The recipe card didn’t have a name, so that’s what I’m naming them. These taste suspiciously like the old Haystack cookies except instead of chow mein noodles, they have Rice Krispies in them. 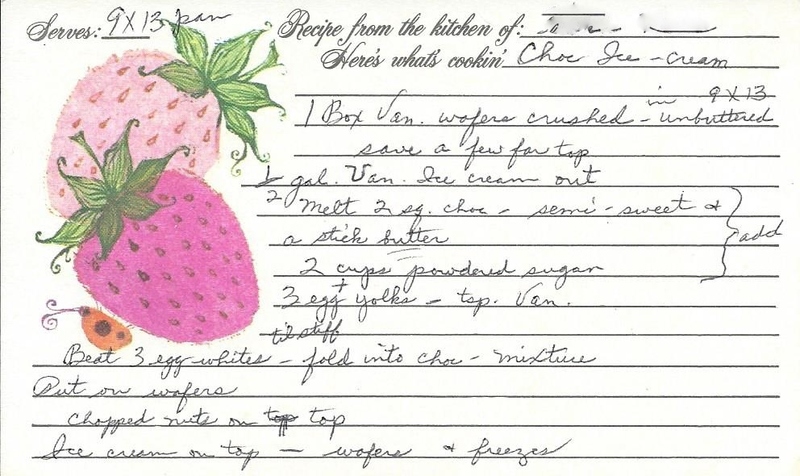 This card has my mom’s name on it, so chances are she got this recipe from a co-worker. 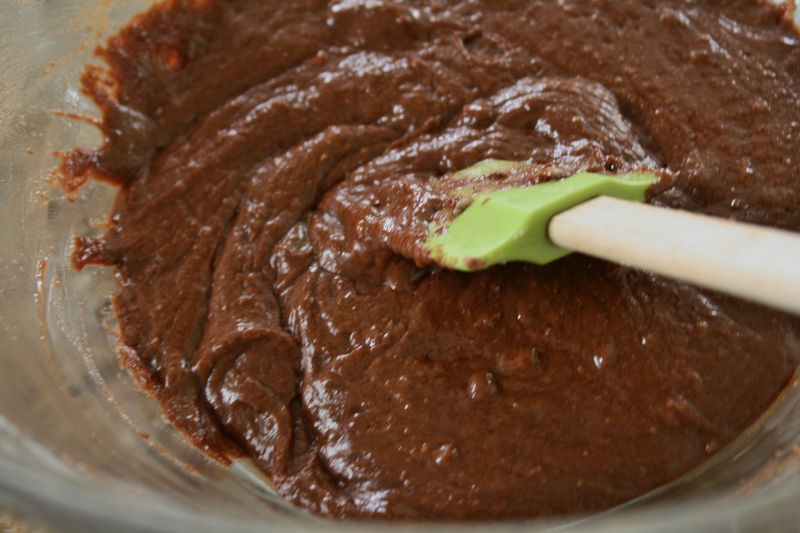 Funny – this recipe has chocolate in it. Hmmm. Yes – it’s from my mom! 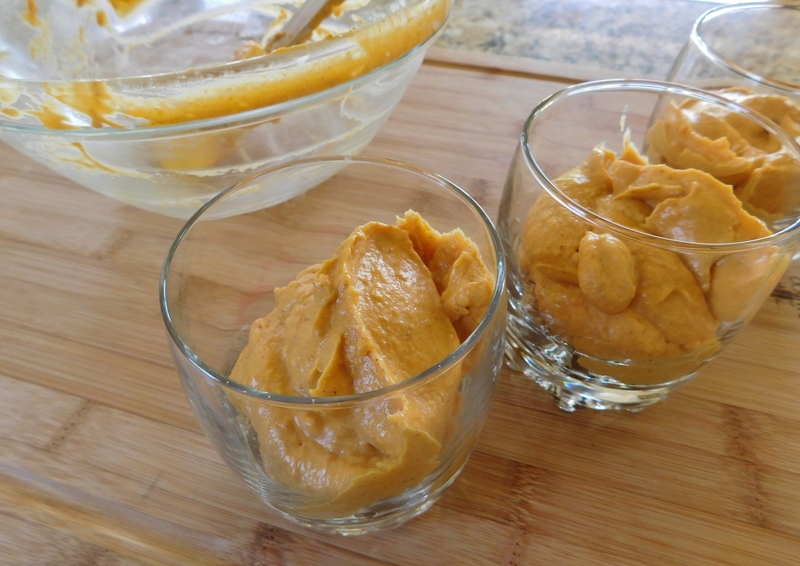 Its easy to melt the chips and peanut butter in the microwave. I used my trusty little ice cream scoop to make these as uniform as possible. Without it I think they would have been more spread out. The scoop kept them a bit more mounded. I let them sit about an hour to firm up and then I hid them so they would at least last overnight. 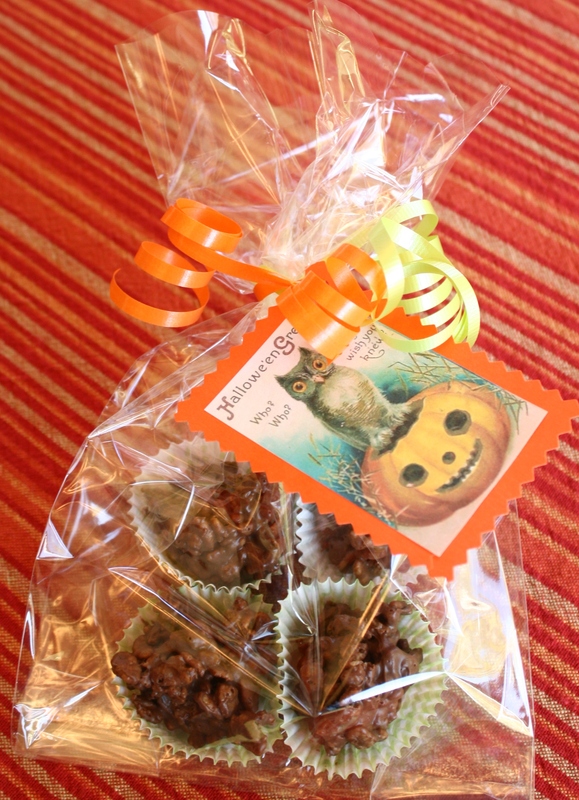 These also make great Halloween treats for girlfriends! Part Two coming on Friday – check back for a quick tutorial on how to make these cute pedestals! This heat is getting to me. We need a cool and creamy treat for the Labor Day weekend! 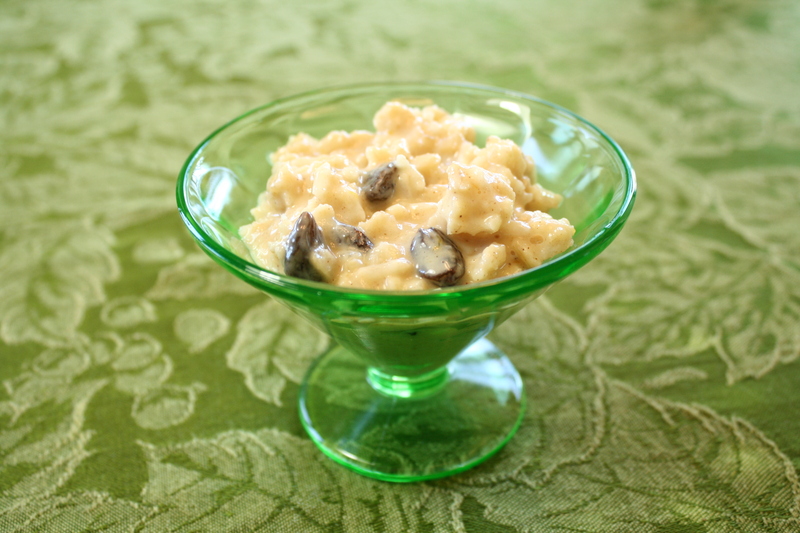 Today’s recipe is Hydrox Frozen Dessert. Since I don’t think they make Hydrox Cookies anymore, I’ve renamed this recipe Oreo Frozen Dessert. 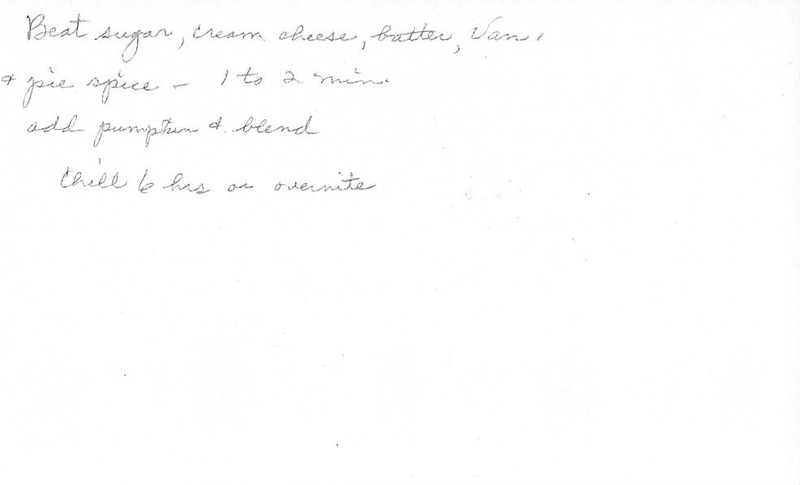 Note that this is another recipe marked “V Good”. 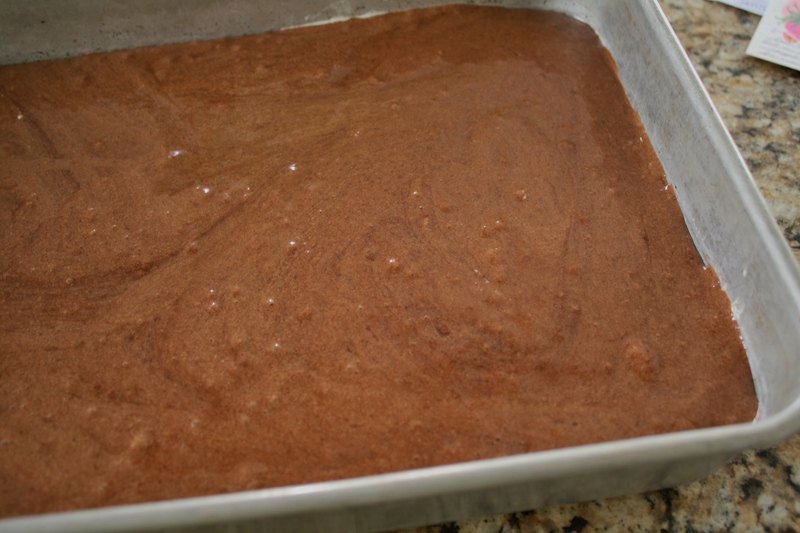 Mix as pie crust and pat into two 9 x 13″ cake pans. 1 large can Carnation Evaporated Milk (12 oz. ), 1/2 cup of butter, 1 cup of sugar, and two squares of melted chocolate (I looked online and found that 1/3 cup of chocolate chips is the same as 1 square of baking chocolate. So I used 2/3 cup of chocolate chips and it was fine). 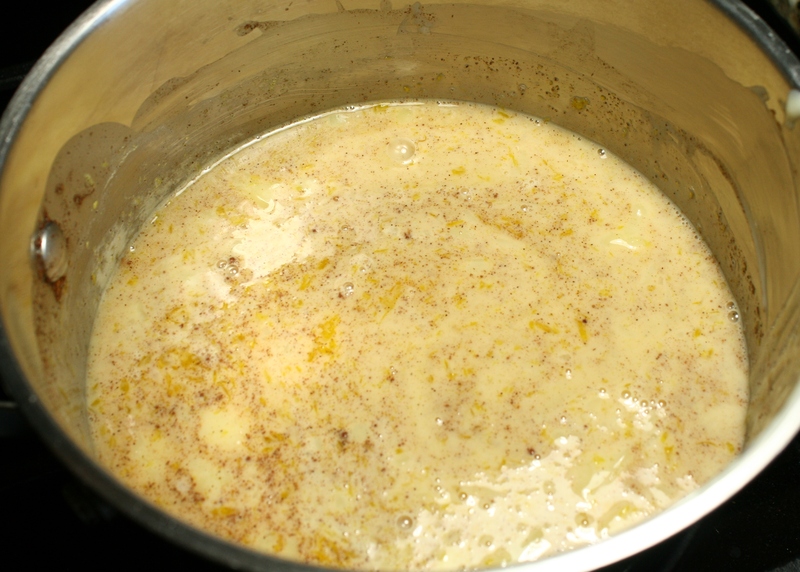 Combine in a heavy saucepan and boil for 10 minutes, stirring often. 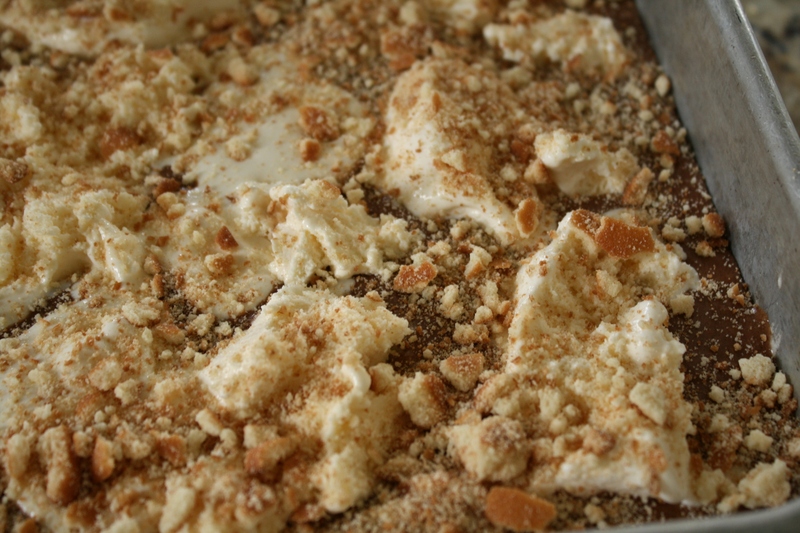 While the filling is cooling, soften one half gallon of vanilla ice cream (I used the square boxes of vanilla ice cream and it now only comes in 1.75 qt box) and spread over the crumbs in the two pans. When frozen, spread the cooled chocolate filling over the two pans and put back in freezer. 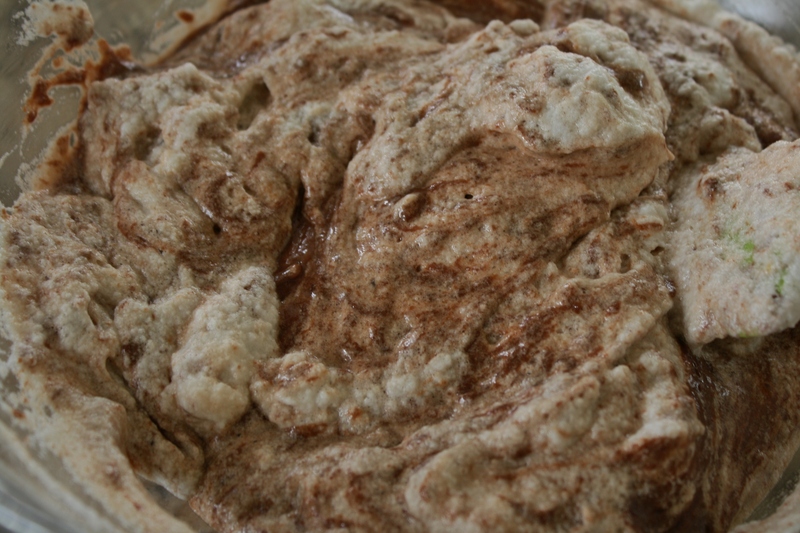 When frozen, whip two cups whipping cream and spread on top. Sprinkle on your favorite nuts. 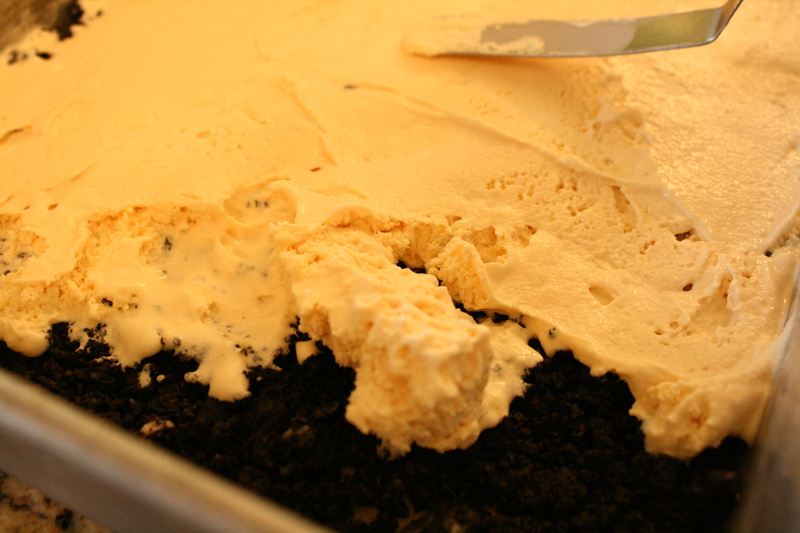 Spreading the ice cream over the top of the Oreo crumbs. 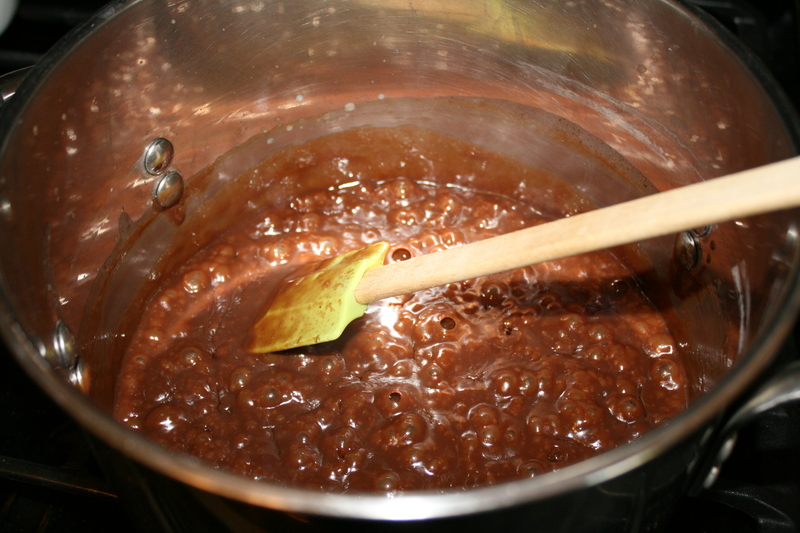 Here is the chocolate filling after the 10 minutes of boiling. It was somewhat thin at first but thickened up and ended up being a nice fudgey sauce. I might just use this as a fudgey ice cream topping. My trusty taste tester had one word for this dessert . . . I guess we got our summer back! It has been a HOT week in Minnesota! 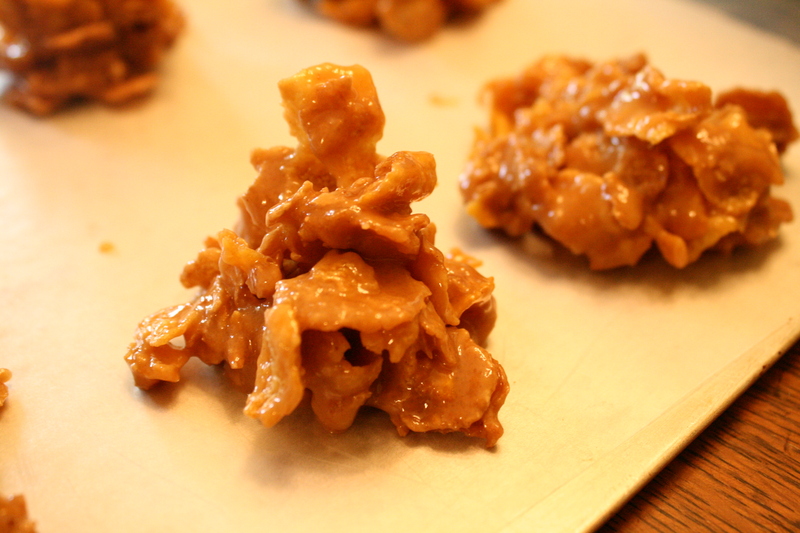 The heat is not great for baking, so we’re going to do another no-bake cookie. 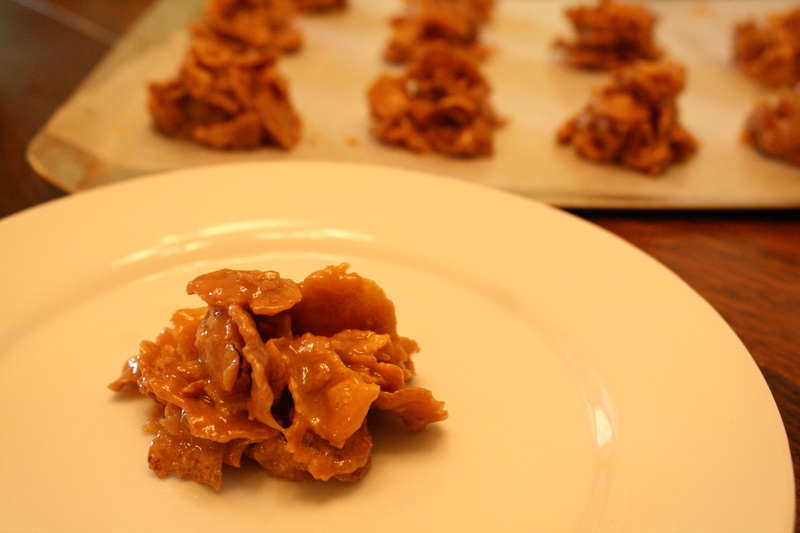 Corn Flake Cookies is the name I gave them since the title of the recipe on the card is Cookies. 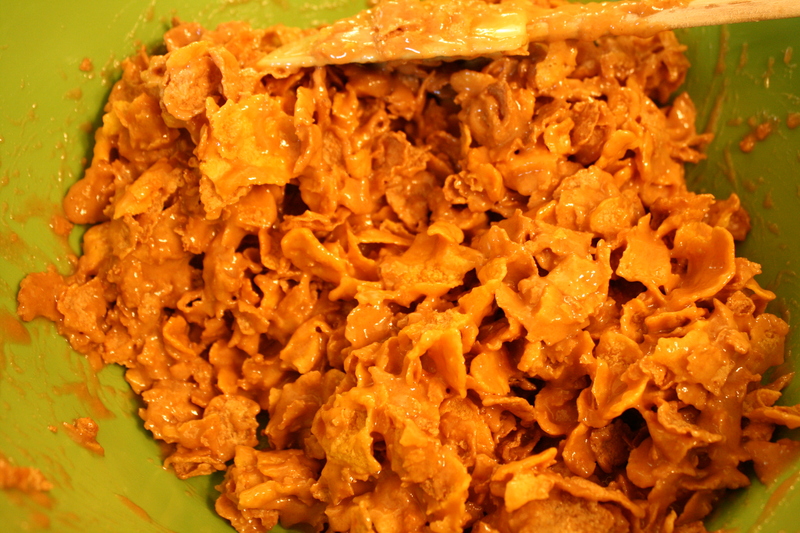 Again, I looked at these ingredients and there seemed to be a lot of syrup and not a lot of cornflakes. 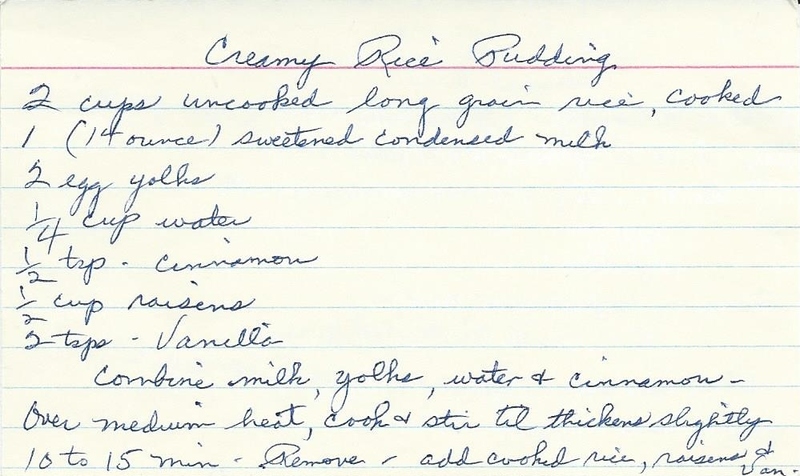 Why do I keep doubting Grandma’s recipes? Mix in saucepan and melt. Pour over top of 6 cups of corn flakes. Drop by spoonfuls on waxed paper lined baking sheets. Let sit until firm. They do firm up faster in the refrigerator. The mixture doesn’t hold together too well until it cools a bit. I did let them sit a few minutes and then piled the mixture up a bit more in the cookie shape. Another very addictive and somewhat different kind of cookie.